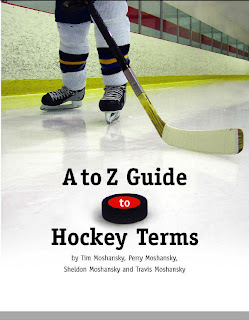 The Moshansky family have updated their book A to Z Guide to Hockey Terms, first published in 2008. The book continues to be the leading hockey pocket dictionary. But it also offers much more in it's deceivingly small format. It also acts as a quick reference for penalty signals, farm team affiliations, statistics abbreviations, Stanley Cup and Olympic winners and rink layouts. The quotes and "Did You Know" sections are fun reads to. You can read my original book review for the original edition here.